American beer labels are surprisingly devoid of special badges and emblems. However, anyone who has picked up a bottle from Belgium may have seen any number of unique little logos besides the brewery’s own adorning the bottle’s label. What do they mean? Are they legal trademarks? Who gets to use the logo and in what circumstances? In this special two post series, we’ll explore the iconography of Belgian Beer labels and learn what the logos mean and who they represent. Some of the most recognized beers to carry this label are: Delirium Tremens, Bush Ambrée (Scaldis in the US), Duvel, Gouden Carolus, Poperings Hommel, Saison Dupont, Petrus Aged Pale, Palm, and St Bernardus ABT 12. There are at least 185 currently listed beers from the 22 breweries that carry the logo. Not every beer brewed by the brewery qualifies. You can find the full list of breweries and beers on the Belgian Family Brewers website (linked above). Unlike the BFB, HORAL isn’t as well-known outside of Belgium. HORAL collects together the traditional Lambic and Gueuze blenders and breweries. Founded in 1999,The organization has mainly worked to protect the heritage and name of the Lambic & Gueuze beers and the region form which they come. They also organize the Tour de Gueuze which takes place every other year in May. One of their newer initiatives is the creation of a Lambiek Academy which even offers some classes in English. HORAL also creates a “Mega Blend” every year using beer from each of its members. When I last visited Brouwerij Boon in the fall of 2014, Frank Boon was in the process of creating the current vintage of the Mega Blend. HORAL has been working with the Belgian Government and more importantly, the European Union to define and protect the heritage of their products. The laws define the production methods, region, and terms that are allowed. It also protects the member breweries and their products from people trying to capitalize off of their fame. Ironically enough, the organization also works to protect its members from the EU and its health & production codes. brewed in the Brussels region and the surrounding Pajottenland; basically, the area surrounding the Zenne River valley. brewed with unmalted wheat, usually 30% or more. designates certain terms that are protected and can only be used by qualifying breweries and beers. HORAL’s members number 12 brewers and blenders: Boon, Girardin, Hanssens, De Oude Cam, Tilquin, De Troch, Lindemans, Mort Subite, Timmermens, Drie Fonteinen, Oud Beersel, & De Lambiek (the official visitor center of the Lambic producing region). You will notice one glaring omission and one expected omission from this list. The expected omission is Belle-Vue. The once venerable old Lambic house sold a minority stake to the Artois Brewery in the 1970s. At the time, this helped the brewery gain new markets and investments. However when Artois and Jupiler merged to form Interbrew, the new conglomerate picked up a majority stake in 1991 and has since systematically changed Belle-Vue from a once respected brewery to a lambic-esque flavored alcopop. They discontinued use of the coolship and do the vast majority of their conditioning in steel. As far as I can gather, no traditional beers are produced by Belle-Vue. The glaring omissions is Brussels’ Cantillon. Cantillon has never been a member of HORAL. In part, it’s because they object that some of the members produce non-traditional beers. The Van Roy family has largely operated on its own in their pursuit of ultra traditional lambic beers. 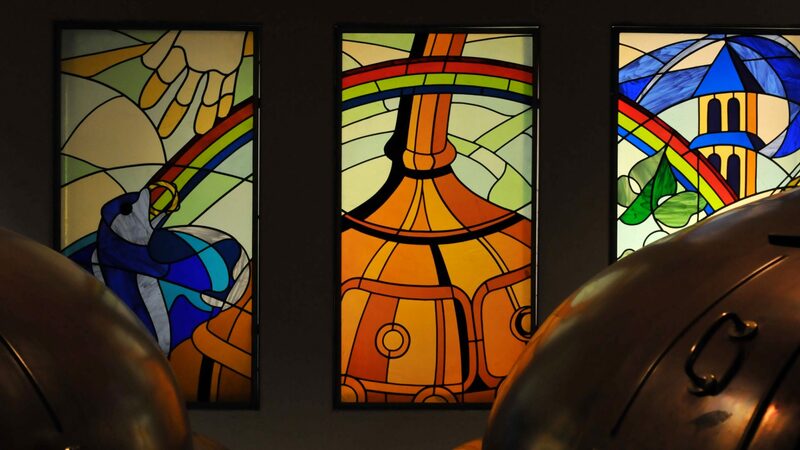 While many producers created sweetened beers to adapt to the times, Cantillon turned their brewery into an operational museum which they used to sell their beers, create an extra revenue stream, and to spread the word of traditional Lambic & Gueuze. This is why Cantillon’s beers don’t use the term “Oude” on their labels. While all their beers are indeed fully spontaneously fermented and bottle conditioned without addition of sugar and yeast, they use their own labeling conventions. Although things might be changing somewhat in the relationship between HORAL and Cantillon, Frank Boon had received a shipment of Cantillon beer for the Mega Blend he was working on. This marks the first year Cantillon will be included in the blend. The GTS label can be used on any product, beer or otherwise, that qualifies with the European Union as a special product. Some Lambic brewers use this logo on their beers. This logo came about with Regulation (EEC) No 2081/92 of July 14, 1992. You can read the full text of it here. Several West Flanders brewers have applied to the EU to gain this protection for their classic Vlaams Oud Roods & Oud Bruins (Flemish Old Red & Old Brown Ales). Belgian Beer Paradise is a mark maintained by the Belgian Brewers Union (BBU). Only members of the BBU can use this logo. The trademark is to be used on beers of good quality, excluding “private labels” (those brewed for grocery stores and the like). Only Belgian brewers or breweries that have obtained the license to a Belgian beer can use this logo. The beers must be sold and marketed in Belgium. The beers must exist as unique products not marketed under multiple labels. Interesting read. Looking forward to Part II! Thank you for this excellent post and Happy Thanksgiving. Thanks for Reading, Thomas! Happy Thanksgiving to you!